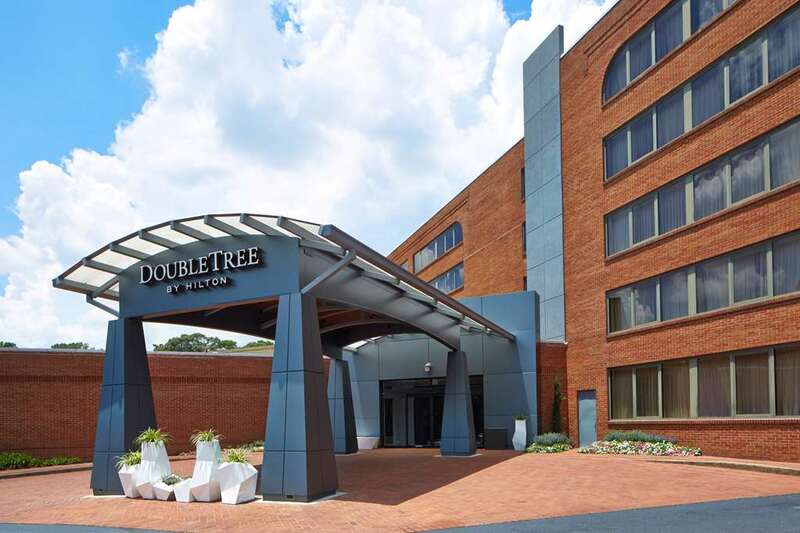 Be close to Perimeter Center when you stay at the completely renovated DoubleTree by Hilton Atlanta Perimeter Dunwoody. Our hotel is convenient to Fortune 500 businesses such as Cox Enterprises UPS and Home Depot plus upscale shops Atlanta attractions and sports arenas. To help you get there we operate a complimentary shuttle to the MARTA station and other stops within 5 miles of the hotel. Savor our signature DoubleTree chocolate chip cookie before your work or play begins. Our event-savvy hotel provides 10 000 sq. ft. for your Atlanta meeting or wedding only 24 miles from Hartsfield Jackson International Airport. Expect inspired service and business center support when you reserve one or more of our 11 meeting rooms. The ballroom is perfectly sized for a grand wedding reception. This Dunwoody hotel has dining options that suit your schedule. Savor authentic Southern barbeque at our restaurant which also serves breakfast lunch dinner and room service. The convenience market is always open for snacks. After indulging in delicious food work off extra calories in our fitness center or just relax in the heated outdoor pool. All of our freshly renovated accommodations include free WiFi and a workstation. Need extra room. Each of our Atlanta suites is designed with a separate living room conference desk and an extra half bath. We offer accessible rooms too. With all of this convenience you*ll know we have you in mind when you stay at DoubleTree by Hilton Atlanta Perimeter Dunwoody. See rate rules for guarantee requirements. See rate rules for cancellation requirements. Southern cuisine with a modern twist in a communal space and inviting atmosphere. The contemporary southern comfort dishes presented by a friendly experienced staff will make your dining experience at the Southern Grove a charming treat. Farm to table organic Hamburger restaurant. Continental cuisine with large selection of wines. American Restaurant Farm fresh southern food. Pizza Pasta restaurant 4.5 out of 5.0 Star fun family atmosphere. With a moving beak and eyes, it's a Kentucky Fried Chicken restaurant sign. Souvenirs available. Almost 60 feet long and almost 200 years old. Moved outdoors, so even those not awaiting justice can sit on it. Bonze statue in front of Rome's city hall provides a detailed depiction of human infants Romulus and Remus sucking on the teats of the Capitoline Wolf of Roman legend. A 1929 gift to the city from Mussolini (yes, that Mussolini). Watch in awe (or horror) as puffy Cabbage Patch Kids are actually "born," delivered by doctors and nurses, from the Magic Crystal Tree.